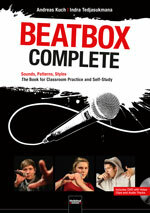 Set a clear course with rhythm games and arrangements for body percussion in English in every music and English lesson for children aged 6 or 7 years up to the advanced level. Many Groove Games are terrific as dynamic ice-breakers and / or warm-ups and also as in-between active breaks: also suitable for substitute teaching and for working with adults. 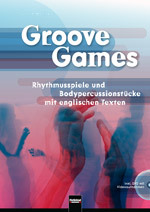 Whether playing in rhythm or drum circles with children, youths or adults, basic rhythmic skills are learned, developed and continually improved with Groove Games: this comprehensive guide to teaching rhythm helps to improve the feeling for pulse and groove, for bars and phrases, to train rhythmic synchronisation, to encourage the development of playing solo and tutti, to support practicing the difference between beats and off-beats, and to develop rhythmical security and creativity. 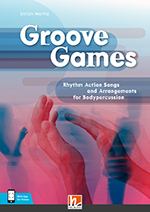 Playing Groove Games increases attentiveness, concentration and coordination. But most importantly, playing with rhythms in a group is great fun, supports the community and improves team spirit – not only when playing music! The single-part Warm-ups, Circle Games, Imitation and Partner Games are relatively simple, short and rhythmically and linguistically easy to understand. 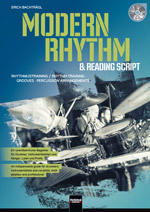 The multi-part Rhythm Canons, Rhythmicals and Performance Pieces require more sophisticated sequences of movement, complex rhythms and have forms with several sections. The pieces are organised within each chapter according to their level of difficulty (1 to 5) and each piece’s level is clearly indicated. Furthermore, all of the pieces go along with practical ideas as to how to make variations to simplify or further challenge advanced players: this allows almost every piece to be made to fit the skill level and preferences of your group. Additional tips on the methodology for working on the pieces further ease preparation. Access to video files included! 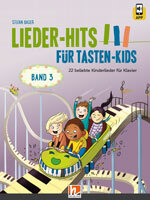 The pieces from the book come alive while being played by primary school children, eighth graders, and a group of young adults: they will give you a lively impression of all the pieces and allow you to learn the rhythms and arrangements of the pieces more easily. Moreover, they are a lot of fun watching.